Budget highlighters - Chit Chat Highlighter, I think I purchased this from a pound shop a while ago now, the nail polish like brush inside is pretty naff but it comes out very creamy, you only need the tiniest amount and it is very shimmery. I would suggest this more for a night time look maybe. 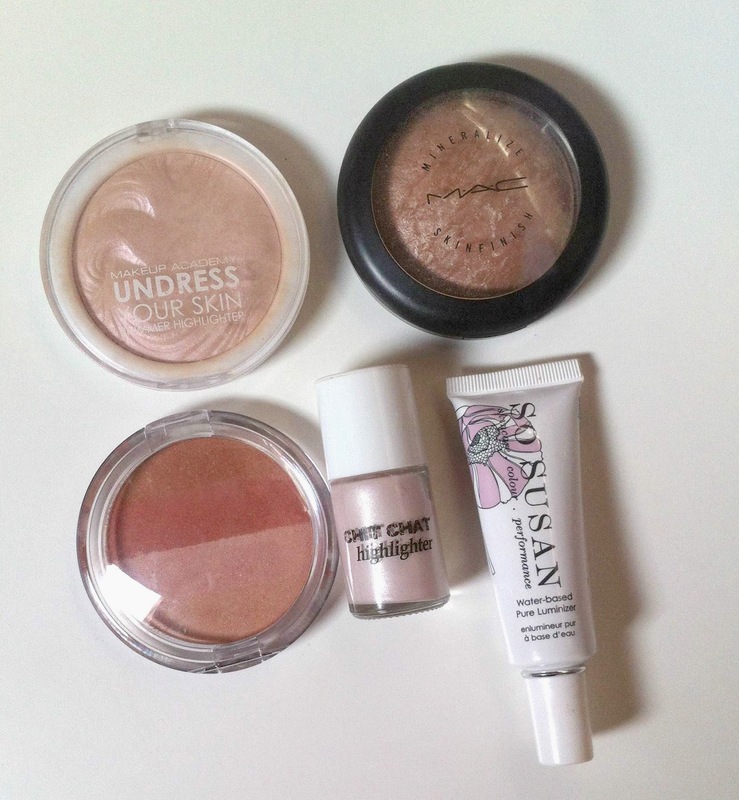 MUA Undress your skin shimmer highlighter, the embossing on the powder is beautiful looks like champagne waves, the colour itself is a champagne pink and give you a gorgeous glow, it's not even too much for the day time and lasts all day, it was pretty hyped up on the blogosphere when it first launched, it is definitely worth the small £3 price tag. Mac Mineralise Skin finish in soft and gentle, one of my favorite highlighters that I use daily, I use this for day and night just a sheer amount of shimmer, when the light hist your face it looks beautiful. I constantly get complimented on it and everyone notices it which is nice as I find with some highlighters you can't tell yourself if you put it on or not, this one will always be my favorite I think. So Susan water based pure luminizer, a very large tube which will last you forever! It is another highlighter that is very pink toned and champagne like with the shimmer particles running through, it is very complimentary on the skin and instantly illuminates your cheek bones and brow bone. It is infused with pearlescent pigments to create the perfect wash of light and make your skin glow. Then lastly a new highlighter that I kindly got from Rachel Lamey to review which will be going up soon is the Royal Effem Beautiful highliter in 001, I am in love with this product already after just two uses! To be honest I have fell in love with everything I have tried from Royal Effem already, for a company I have never heard of before they know there sh..stuff. But back to the highlighter, I won't say too much as there will be a full review soon but it is highly pigmented you literally need the tiniest swipe of your brush and you get the most gorgeous tones on your skin and it works as a bronzer, blusher and highlighter in one! 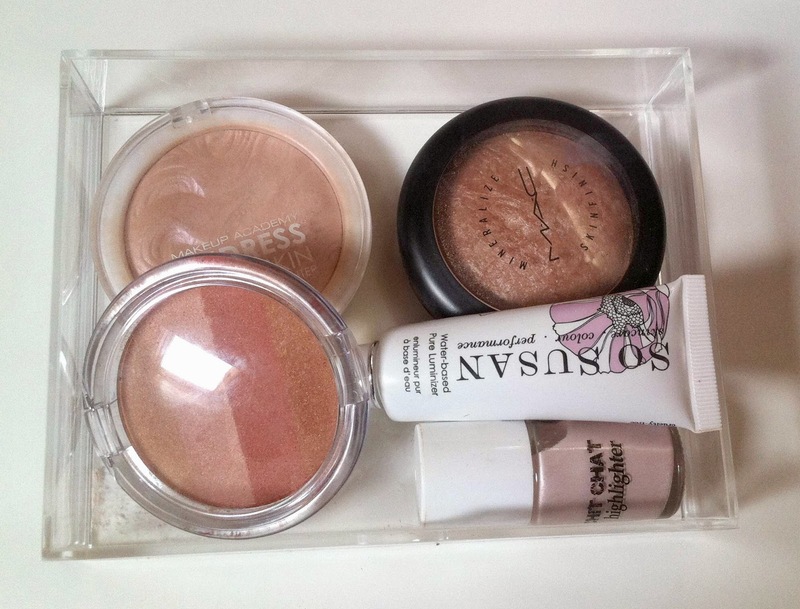 Well worth the price tag as it is needed for a quick fix in the make up bag.